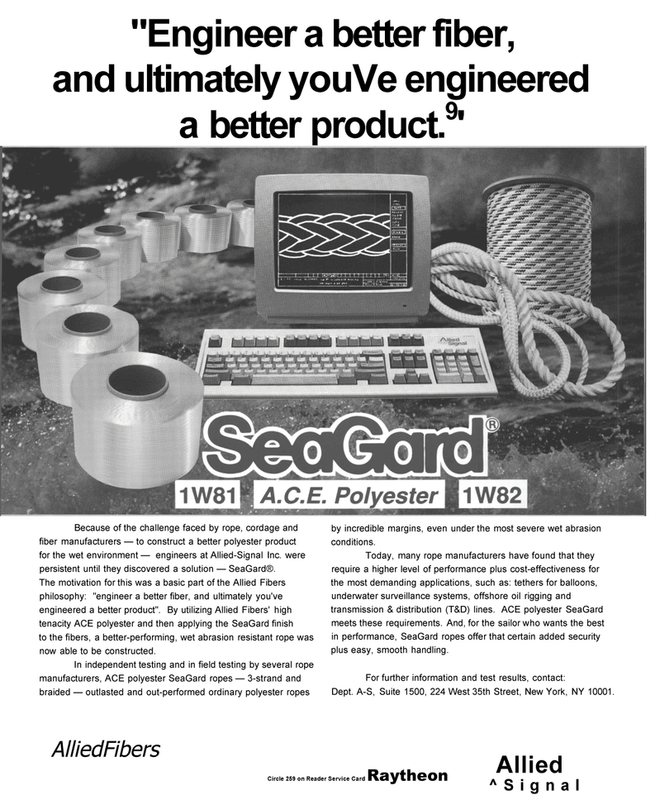 Because of the challenge faced by rope, cordage and fiber manufacturers — to construct a better polyester product for the wet environment — engineers at Allied-Signal Inc. were persistent until they discovered a solution — SeaGard®. The motivation for this was a basic part of the Allied Fibers philosophy: "engineer a better fiber, and ultimately you've engineered a better product". By utilizing Allied Fibers' high tenacity ACE polyester and then applying the SeaGard finish to the fibers, a better-performing, wet abrasion resistant rope was now able to be constructed. In independent testing and in field testing by several rope manufacturers, ACE polyester SeaGard ropes — 3-strand and braided — outlasted and out-performed ordinary polyester ropes by incredible margins, even under the most severe wet abrasion conditions. Today, many rope manufacturers have found that they require a higher level of performance plus cost-effectiveness for the most demanding applications, such as: tethers for balloons, underwater surveillance systems, offshore oil rigging and transmission & distribution (T&D) lines. ACE polyester SeaGard meets these requirements. And, for the sailor who wants the best in performance, SeaGard ropes offer that certain added security plus easy, smooth handling. Dept. A-S, Suite 1500, 224 West 35th Street, New York, NY 10001.